The cheapest, fastest, and most hassle-free way of getting from Delhi to Haridwar is definitely to take the train. The only concern is that trains do book up early, especially from April onward (the most popular time for Hindu pilgrims), so you may find yourself on the waitlist. If you don't mind getting an early start, the daily 12017 Dehradun Shatabdi departs New Delhi Railway Station in the early morning. The other superfast Shatabdi train, the 12055 Dehradan Jan Shatabdi, is an afternoon service that departs New Delhi Railway Station. A number of other trains from Delhi to Haridwar depart from H. Nizamuddin Railway Station and take around five to six hours to reach Haridwar. There are also three overnight services departing from various Delhi railway stations. 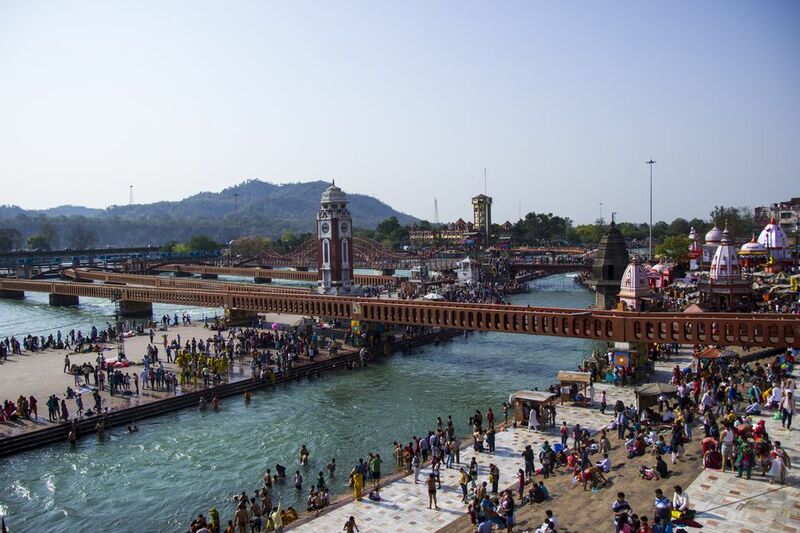 Delhi to Haridwar by bus is a convenient option if the train is heavily booked, which is often the case as holy Haridwar is a popular spiritual destination in India. Travel time is usually six to seven hours, with one stop for lunch or dinner. The buses leave from Kashmere Gate ISBT (Interstate Bus terminal) to the north of Old Delhi, which was renovated and reopened in May 2013. Services start running in the morning, and the last service departs late at night. There are both private and government buses. It's actually preferable to go with a government operator because it's cheaper and offers a better and more reliable standard of service than private companies. Depending on the level of comfort required, you can choose from air-conditioned "luxury" Volvo, air-conditioned Deluxe (Hi-Tech), Semi Deluxe, and Ordinary buses. Some even have wireless Internet. Uttarakhand Roadways/Uttarakhand Transport Corporation is a popular government operator. Their Volvo bus departs Delhi in the late morning each day and arrives in Haridwar in the evening. Other options include Delhi Transport Corporation and Uttar Pradesh State Road Transport Corporation (UPSRTC). MakeMyTrip: MakeMyTrip acquired Ticketvala (previously India's largest bus ticketing platform) in 2010. It offers a best-price guarantee and often has special promotions such as discounted hotel rooms with bus ticket bookings and discounts on return fares. Bookings can be made online or via an app on cell phones. Foreign credit cards are accepted. The website shows ratings for each bus service. It's possible to book UPSRTC buses. RedBus: One of the first websites in India to offer online bus bookings, RedBus doesn't charge booking fees. Bookings can be made online or via an app on cell phones. It has a special online bus tracking platform that provides live tracking of buses based on GPS updates. RedBus was acquired by ibibo Group in 2013 but still operates independently. The website shows ratings for each bus service. It's possible to book UPSRTC buses. TicketGoose: ​TicketGoose has been in operation since 2007 and has outstanding real-time tracking of inventory. Its website automatically shows the layout of each bus and the location of vacant seats, without requiring any clicks. Bookings can be made online or via an app on cell phones. Fares typically are lower for non-air conditioned seater buses and increase with air-conditioned semi-sleepers or sleepers. (Sleepers have single or double "beds" that you can lay down in, while semi-sleepers have seats that recline further than usual). If you're traveling overnight, it's worth paying the extra to get a decent sleep. Do note that none of the buses, including the luxury Volvos, have toilets. However, the Volvo buses have superior suspension, and snacks and water are served onboard. If you're taking your own transport from Delhi to Haridwar, one thing to keep in mind is parking. Many hotels are located by the riverside and don't have parking or car access. You may end up having to park your car a little out of town. It's possible to take a taxi from Delhi to Haridwar, although it's an expensive option.